Drawing on the work of medical researchers, anthropologists, historians of science, and sociologists, Identity Politics and the New Genetics: Re/Creating Categories of Difference and Belonging explores how science and culture are used to create and perpetuate ideas of race and ethnicity. The volume was published as a paperback in November. 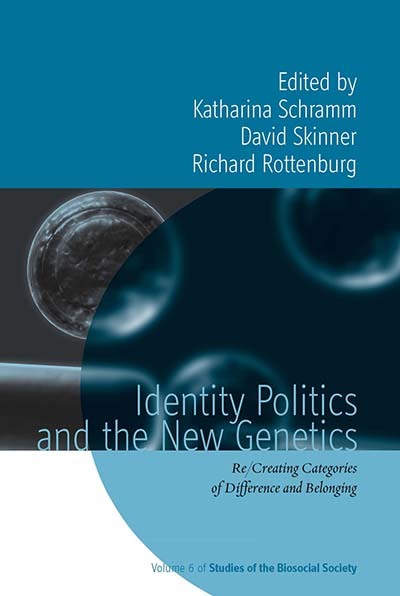 Following, David Skinner, who co-edited the volume with Katharina Schramm and Richard Rottenburg, reflects on the volume’s reception and its distinction from other volumes on genetics and social history. As the attention devoted to science journalist Nicholas Wade’s recent book A Troublesome Inheritance: Genes, Race, and Human History illustrates, discussion of race and genetics is habitually deemed ‘difficult’ or ‘controversial’. Wade is one of a long line of writers who portray themselves as fearless truth-seekers battling the politically correct consensus that races are social not biological types. Many commentators rightly question Wade’s and others’ claims that inherited characteristics and capacities underlie popular understandings of race. But should we also take issue with the assumption that to discuss race and genetics together is to break a contemporary taboo? This truism is challenged by a collection I co-edited with Katharina Schramm and Richard Rottenburg Identity Politics and the New Genetics: Re/creating Categories of Difference and Belonging which has recently been published in Berghahn paperback. Our collection explores the varied and sometimes surprising ways in which genetics now regularly features in lay and expert discourse on race and ethnicity. Chapters in the book focus on the use of population genetics to develop media narratives about people and nations, the routine use of genetic techniques and idioms to make sense of kinship and heritage, and the appeal of commercial genetic ancestry testing services as a source of genealogical truth about roots and ethnicity. Moreover, other chapters highlight the commonplace use of racial and ethnic categories in medical genetics and police forensics. But in these recent popular and scientific usages, ‘race’ is neither a simple biological reality nor is it merely a social construct. Rather, it is a malleable bio-social hybrid that is flexible enough to make sense (and be argued over) across a range of different institutional and knowledge-making contexts. This points to developments more complex and novel than a reboot of old-style race science. As our collection shows, the concept of identity and the right or obligation to identify actively in racial or ethnic terms is a recurring theme across these developments. So, for example, genetic researchers now typically depend on people’s self-identifications to place subjects into the racial/ethnic categories on which they base their analyses. The apparent paradox of cultural identifications serving as the foundation of scientific pronouncements on genetic group differences is one Nicholas Wade and others would do well to reflect on. David Skinner is Reader in Sociology at Anglia Ruskin University, UK. His publications on the politics of race and science include ‘Racialised Futures: Biologism and the Changing Politics of Identity’ in Social Studies of Science (2006); and ‘Groundhog Day? The Strange Case of Sociology, Science and Race’ in Sociology (2007). Katharina Schramm is Senior Lecturer at the Institute of Social Anthropology at Martin-Luther-University Halle-Wittenberg and Research Associate at the Max Planck Institute for Social Anthropology. Her publications include African Homecoming: Pan-African Ideology and Contested Heritage (2010) and Remembering Violence: Anthropological Perspectives on Intergenerational Transmission (co-editor, 2009). Richard Rottenburg holds a chair in Social Anthropology at Martin-Luther-University Halle-Wittenberg and is Max Planck Fellow at the Max Planck Institute for Social Anthropology. He has written and edited books on the Sudan, economic anthropology, the transcultural production of objectivity and theorizing postneoliberal governance. Among these is Far-Fetched Facts: A Parable of Development Aid (2009). « Celebrate National Anthropology Day with Berghahn!